Scroll down to see all four videos! Ed matches wits against a Kohler “Intelligent” Toilet in this Fox Business News story. 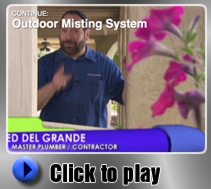 Watch this great clip of Ed in action on the classic DIY Network series. Click to connect to DIY Network’s website. In this clip, Ed and the director of the National Hurricane Center discuss storm preparedness. ShopSmart Magazine, published by Consumer Reports, voted this howdini.com video one of the best home repair videos on the internet in 2013. To date, it has over 3 million hits! To contact Ed for news interviews, please email eadelg@cs.com.